Among the various ways Justin Trudeau is being slammed for his handling of the SNC-Lavalin affair, the charge that the Prime Minister has revealed himself during this controversy to be no real feminist is the hardest to pin down. Did he fail to properly respect the independence of the attorney general, back last fall when Jody Wilson-Raybould had the job? On this core question, there are meetings and phone calls and text messages to argue about, rules and codes to interpret, in trying to arrive at an answer. Did he botch efforts to contain the controversy after it exploded, and ultimately go too far in kicking Wilson-Raybould and her chief ally, Jane Philpott, out of the Liberal caucus? On these issues, political strategists, Parliament Hill veterans, and even pundits, have thoughts about crisis management to kick around. Did he somehow let down the feminist side, though? This question naturally arises because the two former cabinet ministers testing Trudeau’s mettle both happen to be women. And, to quite a few commentators, that fact alone is telling enough. But it is hardly sufficient. There’s no solid reason I’ve heard to presume that two male cabinet ministers would have fared differently had they dissented from Trudeau’s handling of a file that brings into play hard questions about the administration of justice, worrying possible economic outcomes, and, yes, potential ramifications in the coming fall election. What’s needed to give the critiques of Trudeau’s feminist credentials heft are facts that don’t require guesses about the dynamics between men and women in Trudeau’s famously gender-balanced cabinet, or speculations about the PM’s own putative biases. In other words, does any data show that he’s running the government in a way that’s better or worse for woman than what came before him? In fact, there are at least some numbers, and they tend to bolster his feminist credentials. Maclean’s asked the Privy Council Office (PCO), the branch of the bureaucracy that supports the Prime Minister’s Office, for recent figures on what are called Governor in Council appointees. These are the fortunate individuals who get paid to work on federal commissions, boards, Crown corporations, agencies and tribunals. 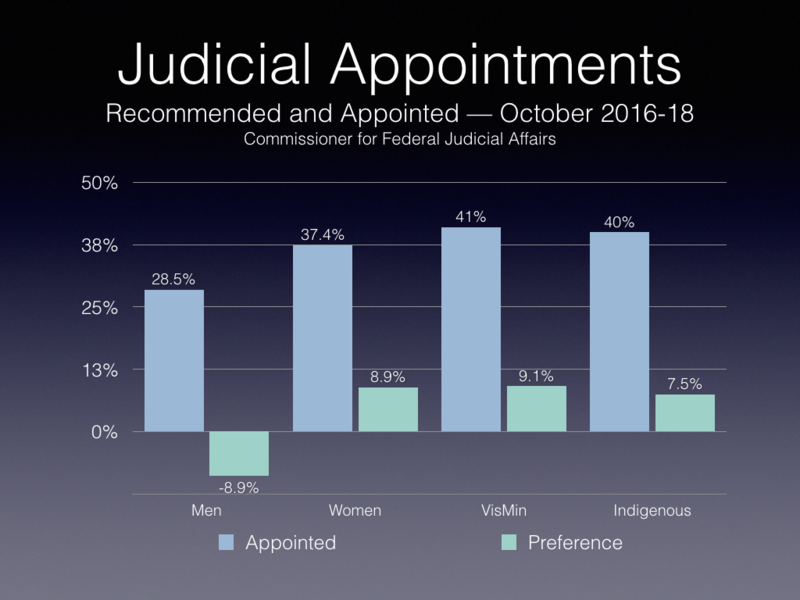 As of the end of 2018, 49 per cent of these appointments had gone to women, according to the PCO data, up markedly from 35 per cent in 2015, the year the Trudeau Liberals beat Stephen Harper’s Conservatives in an election. That 14-point rise in the share of these plum federal jobs going to women compares to just a four-point increase, from 31 per cent to 35 per cent, in the previous three-year period. Those numbers represent—to home in on just one significant segment of them—a shift from women filing only about a third of the seats on Crown corporation boards when the Liberals took power to very nearly half now—up from 34 per cent at the end of 2015 to 48 per cent at the close of 2018. That’s up 14 points in three years of Trudeau rule, compared to six points over the previous three-year span. Looking more broadly at women in the executive ranks of the federal public service—known to bureaucrats by their “EX 01” through “EX 05” designations—there’s been less dramatic change, but still an uptick. The number of women at that level stood at 2,567 last spring, up from 2,264 in the spring of 2015. That meant women accounted for 49 per cent of the government’s executive ranks, up from 46 per cent over that three-year period. Arguably even more important, or at least more prestigious inside the government, is the cadre of deputy ministers—the top mandarins in federal departments. Overall the number of women filling these powerful posts climbed to 39 last year from 30 three years earlier. That translates into 46 per cent women at the deputy minister level last spring, compared to 41 per cent three years earlier. Even taken together, of course, these numbers don’t mean Trudeau’s Liberals have excised sexism from the federal government. Still, weighed against mere impressions of what the SNC-Lavalin affair might signify about his feminist bona fides, knowing how many more women are working in key federal jobs these days has to count for something. Source: Fake feminist? Trudeau’s track record for appointing women looks real. I asked University of Toronto history professor David Wilson, author of a landmark two-volume Thomas D’Arcy McGee biography, what the story of the most famous Irish Catholic in Canadian politics in the mid-19th century might tell us about the challenges facing a Sikh in Canadian politics today. In fact, Wilson had already alluded to the parallel in his writing. He told me McGee would differ with Singh on major points—starting with McGee’s insistence, in the House that day in 1867, that no respectable politician should show up at a meeting where violent radicals are lionized on banners and portraits. Still, McGee’s perspective wouldn’t be congenial to hard-liners today who insist immigrants should somehow stop worrying about what’s going on in their home countries and just be Canadian. On the last day of his life, Wilson says, McGee wrote letters about Irish poetry, and about how Canada’s way of accomodating ethic and religious differences might serve as a model for Ireland. “So, yes, he cared deeply deeply and passionately about Ireland,” Wilson says. And leave behind the worst. For McGee, the worst of Ireland was embodied by the Fenians. His outspoken opposition to them came, of course, at the ultimate cost: he was assassinated by a shot to the back of the head on April 7, 1868, in Ottawa. A Fenian sympathizer was later convicted of the murder and hanged. In the opening chapter of his engrossing McGee biography, Wilson mentions just two other victims of assassination in Canadian history: Pierre Laporte, murdered by the FLQ in 1970’s October Crisis, and Tara Singh Hayer, a Surrey, B.C., newspaper publisher killed in 1998, after years of speaking out against Sikh separatist violence. His initial unwillingness to call out Talwinder Singh Parmar, the founder of a Sikh extremist organization, as the architect of the Air India bombing has now morphed into a lawyerly response: he accepts the findings of the Air India inquiry, which found that Parmar—who was killed by Punjab police in 1992, and continues to be the subject of conspiracy theories that claim he was in fact an Indian agent—was behind the attack. And when asked whether violence is justified in the name of Sikh liberation, Singh equivocates, stating that these sorts of questions are complex when a religious minority is being systematically murdered by the state. He’s right—these are complicated issues that can’t be adequately answered in a sound bite. But if Singh wants to be able to go back to talking about pharmacare and taxes and pipelines, he’s going to have to find a way to articulate the pain of the victims of violence perpetrated by Sikhs—or risk his leadership being overrun by the politics of the 1980s. In some ways, it’s not fair to put the burden of decades of bloody history upon Singh’s shoulders. It’s not his responsibility to condemn every Sikh who has committed an atrocity in the name of the faith. But along with being the leader of the federal NDP, Singh is also the highest-profile Sikh politician outside of India. That, combined with his history of activism on Sikh issues, means these are not questions he has the privilege of dodging. When he talks about the violence that Sikhs have had perpetrated against them with such passion, and then becomes elusive and defensive when Khalistani violence is raised, it makes it appear that he only cares about the former. That might be acceptable for a Sikh activist trying to bring greater attention to some of the atrocities that have been done to Sikhs. But a federal leader who is looking to represent the whole country has to do more. Many Sikhs, including myself, are thankful that he talks about the painful history so many families have endured. Those stories are too rarely told. But the trauma of those years extends beyond just the Sikh community. It’s time for Singh to talk about them too. Source: Opinion Jagmeet Singh’s Khalistan problem: The NDP leader talks passionately about anti-Sikh violence—but becomes elusive on the topic of Khalistani violence. Another good piece by John Geddes, with this excellent summary of the data and evidence from the latest OECD immigrant indicators report. 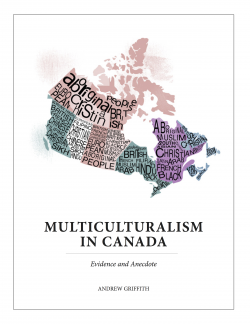 I am a great fan of these reports (used it for the above summary table in Multiculturalism in Canada: Evidence and Anecdote) and am using it to prepare for an upcoming seminar in Copenhagen. I generally find these data based comparisons more informative than the policy comparison indexes like MIPEX or the Multiculturalism Policy Index although both, of course, are helpful to understanding and discussion. All those images of border-crossing migrants, and swaggering tough talk about what to do about them from some federal Conservative leadership aspirants, have prompted a lot of discussion about how Canada absorbs newcomers, and if we do it differently, maybe better, than other countries. My colleague Scott Gilmore warned here that we should brace for anti-immigrant populism to rise in Canada, as it has in other countries after the immigrant portion of their populations reached a certain level. I reported here on research that suggests that where immigrants tend to live in Canada, and how they vote, makes the path to political power steeper for right-leaning populists in this country than in the U.S. and Europe. If the Canadian election map makes taking an anti-immigrant line a losing proposition, and the Canadian way of choosing party leaders makes it hard for a populist outsider to win, there’s still the possibility that the Conservatives might try to activate the economic side of populism. Even there, though, the formula behind Trump and Brexit doesn’t look like a natural ﬁt in Canada. Trump blended his anti-immigrant rhetoric with promises to scrap or overhaul free-trade agreements. The Brexit forces linked discomfort with foreigners to resentment of the EU free-trading order. But in Canada, liberalized trade enjoys broad buy-in—particularly on the political right, and notably in the Conservatives’ resource-exporting western strongholds. So echoing Trump and the Brexiters in railing against unfair foreign competition is a non-starter for Canadian Conservatives. That leaves, perhaps, ﬁnding a way to give voice to the anxieties of that broad swath of Canadians who, as Graves portrays them, fear that the middle class is shrinking and that opportunities for their children and grandchildren are dwindling. But the Tories would ﬁnd themselves playing catch-up with the Liberals when it comes to tailoring a populist message for those worried voters. Trudeau has been arguing since 2014 that failure to push income growth down from high-earners to middle-class families would eventually prompt a dangerous backlash. His answer, or at least part of it, came in last year’s budget, in the forms of a modest middle-income tax cut, an upper-income tax hike and a signiﬁcant boost in federal payments to parents. From the sounds of his Hamburg speech, Trudeau doesn’t intend to leave the next Conservative leader any easy opening to outdo him when it comes to giving voice to the disquiet of Canadians who believe the economic order is stacked against their families. It remains to be seen what additional policies the Liberals unveil in the upcoming budget to back up that rhetoric. If Trudeau fails to deliver, a right-leaning populist might seize the chance to try to ﬁll the vacuum. Overall, though, the prospects for a right-of-centre populist movement in Canada look dim, even though opinion in Canada, according to pollsters like Graves and academics like Donnelly, contains plenty of the same mix of fear and pessimism that fuelled Trump and Brexit. There’s no shortage of Canadians who, if they’d heard Ted Falk wishing God’s blessing for Donald Trump, might well have said, “Amen.” But if they’re hoping that Trump-style populism will slip across the border and succeed in Canadian politics, they’re likely to discover that Canada’s welcoming reputation has its limits. Which brings us to Canada. Will we see a similar rise in populism here? When I sat down to write this column, my instinctive answer was “no.” I agreed with many of the arguments made by my colleague John Geddes, who sees systemic and political barriers to Canadian populism. My thinking was that the apparent growth in global populism is because we are focused on Trump and starting to pay attention. But where I could ﬁnd data, it didn’t support my conclusion. One study from Harvard, for example, found that support for populist parties on both the left and the right has grown undeniably and steadily since the 1960s, doubling its support since then. But it was another study completed late last year by a group of academics from the U.S., Europe and Japan that left me especially troubled. They looked at a dozen European countries to see if there was a correlation between the relative size of the immigrant population and the support for right-wing populist movements. The researchers found that there was a direct connection, and that support grew at an increasing rate as the size of the immigrant population grew. And what is more, their data suggested there was a “tipping point” in western societies: when immigrants comprised 22 per cent of the population, support for anti-immigrant parties approached a political majority. If a country takes in too many immigrants, a populist backlash may be unavoidable. In Canada, our foreign-born population is already at 20 per cent and growing. This is far higher than in the United States and (except for Luxembourg and Switzerland, where there are large numbers of itinerant professional residents like bankers) it is far higher than in any other European nation. And it’s getting bigger. Statistics Canada just released a report that projected Canada’s immigrant population will increase to between 26 per cent and 30 per cent within two decades. This puts Canada well beyond the theoretical 22 per cent threshold in the European study. It makes sense that countries become unstable with too many foreigners. I have ﬁrst-hand experience in places like Pakistan and Timor Leste, where sudden massive inﬂuxes of refugees can pull a country apart at the seams. But is it possible that even when immigrants arrive gradually and they are integrated successfully, it can still destabilize a country? Perhaps a populist backlash is inevitable in Western democracies when the immigrant population grows to a certain size. This is not because the newcomers bring crime or undermine our democratic institutions (they do neither), but because the native citizens, whether they are Canadians or Austrians or Americans, instinctively feel threatened by newcomers. Perhaps the experiences add up—new faces on TV, new clothes in the street, new music on the radio—until the average person reaches a tipping point and pushes back. After all, a fear of strangers is wired into our brains, an instinct that kept us alive in our tribal past. If this is true, it upends a lot of assumptions that this country is built on regarding multiculturalism, pluralism and immigration. Canada may be facing larger global forces, tectonic shifts which are are not felt until it’s too late and a populist earthquake shatters our carefully built house of peace, order and good government. Source: Does Canada have too many immigrants? The “fourth sister” of Canadian politics to use Tom Flanagan’s phrase. Most of the analysis I have seen (2011 Canada Election Study and related articles) have a similar nuanced understanding of the Conservative Party’s success, but all acknowledge the “showing up” aspect of the outreach by Jason Kenney as having an impact on some communities. Harper emphasizes his ability to position his party as closer to new Canadians in terms of policy ideas on the economy and crime, and in terms of underlying social attitudes. But how to disentangle those factors from his undeniable success in the past two elections in simply presenting himself as a more resolute, confidence-inspiring leader? There can be little doubt he’s right that making personal connections, on some level emotional ones, matters greatly. Again, Kenney is widely credited with getting out among various immigrant groups. But isn’t Justin Trudeau proving a huge draw among similar communities? In Trudeau’s case, though, it’s less often a matter of making sure to be present at somebody else’s event, than drawing throngs to his own. Listening to Harper today, there could be no doubt he’s betting heavily on the immigrant vote when it comes to his re-election chances next fall. No wonder. It’s a major part of what brought him to office. The question is whether his assertion of a deep bond between Conservatives and immigrants, based on enduring ideas and attitudes, is accurate—or if, like so much of our electoral politics, it turns out that this strategic swath of votes responds more to a given leader’s persona than anything else. In New York, the Prime Minister talks about winning immigrant votes.